Be sure to check this blog post in case you missed the announcement of our Halloween Parade Winners. But now we are super excited to share our new Happy Harvest Collection with you. You've seen peeks of the products in earlier posts like this one, or this one. But now our Design Team has been playing with it and we hope you will "fall" in love with this collection like we all have. Be sure leave a comment on the posts you love this week and PIN your favorites to Pinterest. We'll be picking a few fans at random that have shared, pinned and commented at the end of the week to win a goodie box of the new Happy Harvest Collection. Supply List: Happy Harvest Collection, Halloween Parade collection (mini pocket), Expression Rub-ons, love letters, sprinkles and Pixies. I think the aqua in this collection is a perfect addition to the fall palette. It reminds me of the perfect bright blue sky in September and October! I can't wait to get my hands on this collection, and I've already pinned several items from it to my wishlist! I just love this super cute collection! This collection is super cute and I love how she used it here on this layout!! Love all that Doodlebug is and does!!! Such a cute collection! I don't think there is a single line of yours I haven't liked!! 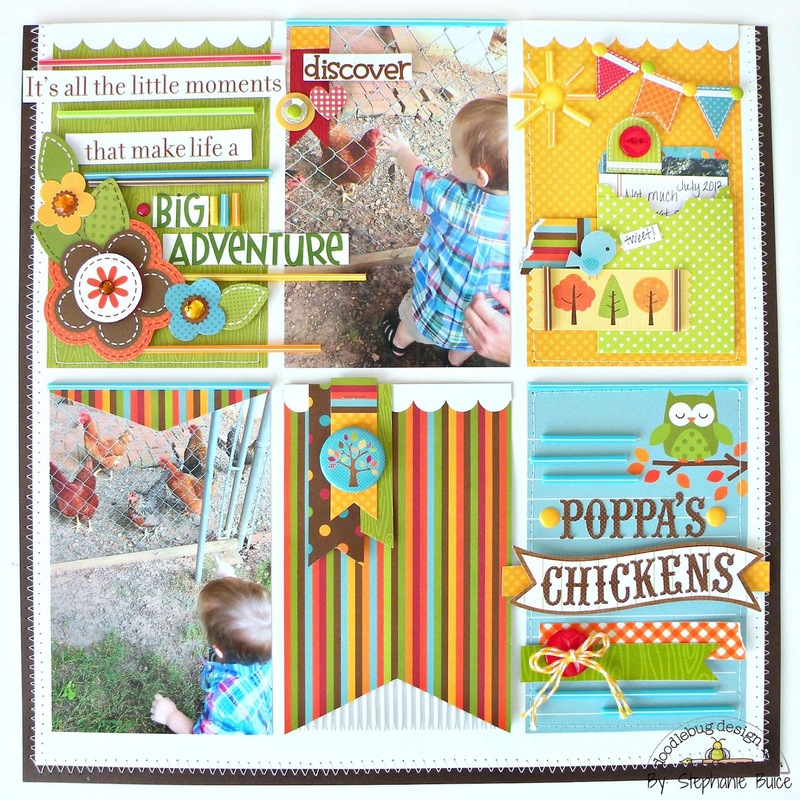 This is such a fun collection, I love the sweet critters and patterns! Pinned this wonderful layout to one of my boards! Adorable!! I absolutely LOVE the owls in this collection! Darling collection!!! Love it all! I love this for fall-bright and happy colors! what pretty happy colors of this new line! also love seeing the different projects! I love anything and everything Doodlebug and I love FALL ... so it's a match made in heaven. Waiting anxiously to get my hands on it! Oh how I love those little animals!!!!!!!!!!! PINNED!! And Shared! I love this collection. The hedgehog is so stinkin' cute. These warm colors and great characters and just fantastic. Thanks so much!! I really like the color scheme of this collection. You have the traditional warm colors and then you added pops of additional colors. Love Love Love! 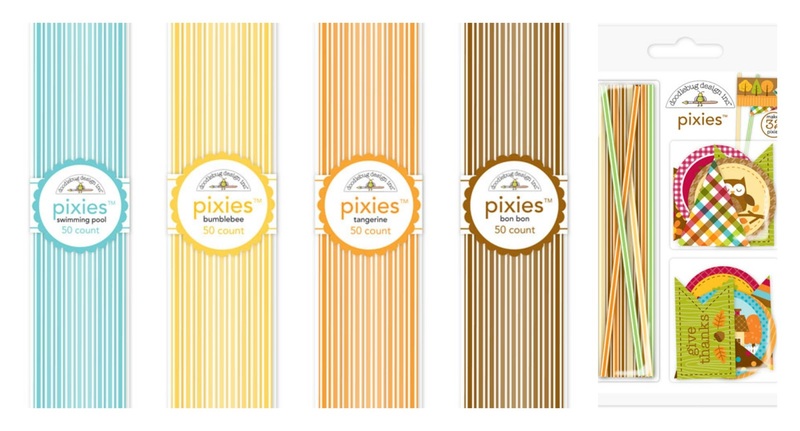 And I want these pixies also! I adore your pixies! This collection outdoes itself. LOVE IT! Love this layout! The flowers just pop off the page. Cute!!! I love the little animals so much!! Adorable. I had to add them. How do you keep coming up with such cute designs? The animals are so cute and cuddly, they are just irresistible. I think this collection is so adorable! Love the owls and all the other cute little critters! This layout is gorgeous! Absolutely love this new line! Stephanie, I love your layout and how you incorporated a sunshine into it. So cute. Oh, my^ so cute cute cute! The animals so adorable! Thanks for giveaway! 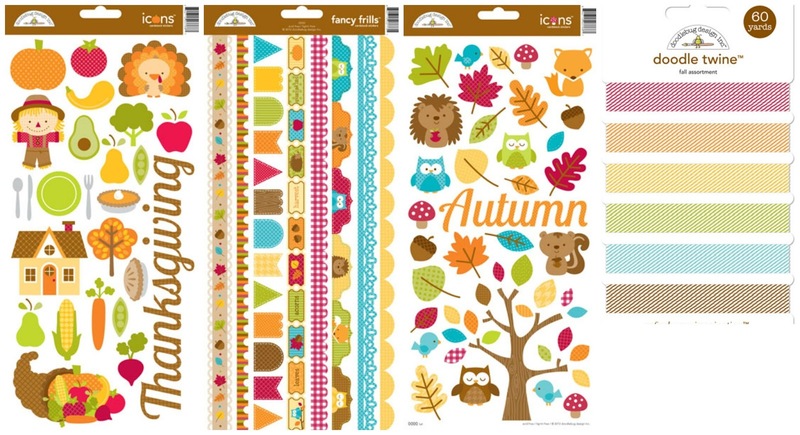 I absolutely love the leaves and owls in the Happy Harvest collection. Love the layout as well. So bright and cute.These colors are fabulous. :) Thanks for the wonderful creativity. Loving this collection, so cute! Great layout! Very beautiful collection. I just love the critters so very cute. one is fun. Love the owls! Cute!! the owls stickers are a must have. Great collection. I love this fall collection! I don't think that there's anything cuter! Great work! Love the bright colors of your adorable layout. Love the turkey and hedgehog! I can't wait to start creating fun Fall Harvest themed pages and decorations. Love, love, love the collection!! Everything is so cute and perfect for fall! I love the colour schemes and the styles of the fonts! I love this paper the colors are great and the animals are so cute!! I think the owl mini doodle-pops are my absolute favourite! I could use them on everything! Great colours in this collection! Awesome layout too. Love the 'sections' look to it! Love this line so much and what a sweet layout! I love this collection and those doodle-pops are super cute! Love the oolors/patterns in this collection! I think it's my favorite! This is adorable!!! I have chickens, too, and I love for little almost 3 yr old GD to come and see them! Look at those adorable critters--loving all the fun elements! I like how they're in little sections and decorated. So much to see. I absolutely love the colors in this collection. I think I might need to get me some of that! This collection is sooooo stinkin' cute!! I especially love the hedgehog and owls, can't wait to get my hands on the collection!!! What a super cute Fall line. LOVE it! The owls are killing me! I don't remember which magazine it was, but one of them asked a couple of weeks ago, "of all the new lines, what is your favorite new collection coming out?" and Happy Harvest was one of my 2. This is so cheerful and cute! This collection is one of my favorites. I love the adorable animal card stock stickers. I pinned them. Thanks for the chance to win! I just love the owls! And it looks like you could make 4 cornucopias out of 1 - 12x12 sheet of paper. Can't wait to use this cute line of paper! nothing would make happier to start the new season than winning this cute collection! I love it! I love fall, so I love the colors of fall and this is a great collection to add to my scrapbooking supplies! This is very cute... love the colors, the details, the images.... everything! I pinned and commenting now. Oh my goodness but I LOVE this collection! The animals are so adorable and I love the fun colors! AWK! I think this might the cutest line that I've seen so far this fall! Love the owl and hedgehog!! this is such a cute fall collection!!! Love this collection, it is adorable. Love the little critters! 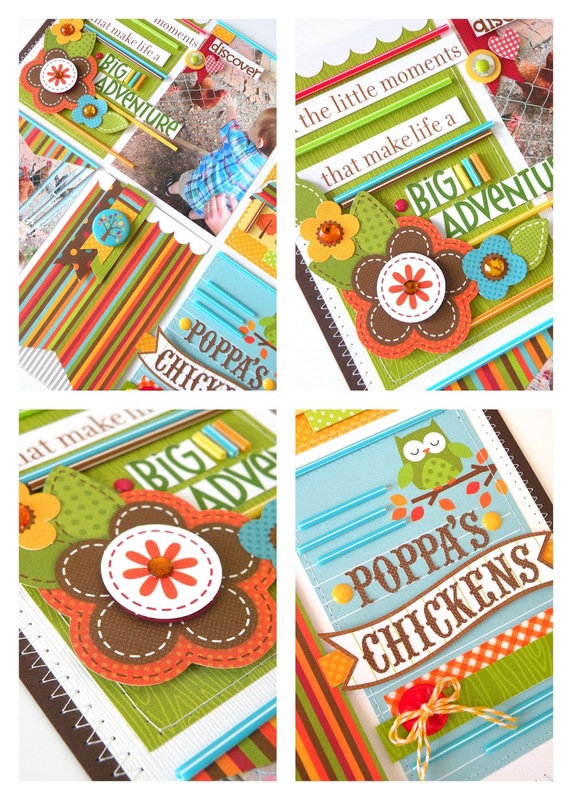 I am totally in love with the Happy Harvest collection! I've already got the 6x6 pad and I just picked up the awesome leaves washi tape yesterday. I have no doubt that I'll be adding to my stash, too. Thanks so much for the chance to win! I ♥ Doodlebug! ADORABLE!!!!!!!!! The owls.....the turkey......the hedgehog.....the flowers......the scarecrow.....the colors......the pixies.......the washi tape!!!!!!!!! Oh what do I like more???? Just ALL of it!!!!! I shared this on my wall and tagged all my crafty girlfriends!! I love autumn, I love doodle bug! I love this collection the most! I sadly cannot pin until I am home from work! (The work gods want me to actually work and not pin - hmmm, go figure)!!! Love the colors! I want it all! I am so in love with this collection! The bold colors and my favorite and so many fun elements! The design team projects have been amazing with so many creative and inspiring ideas! Love, love, love this collection and all the adorable embellishments.